It happens to every drinker sooner or later: You come home excited for the first sip of wine, pop that cork, and then realize you’ve got a real stinker. What was purchased to provide pleasure is only bringing you pain. You could dump the bottle. But, come on, it’s still usable booze, so why not fix it? All it takes is a basic understanding of flavor and scent, along with some household items. Bad wine shouldn’t be exiled. It should be rehabilitated. Remember: Wine is food. Using basic scientific methods to doctor it up is like adding seasoning. Some wines are like eating at upscale restaurants, but the stuff we often grab quickly on the way home is more like fast food: It needs some ketchup. Adding a squeeze of lemon to cheap, watery wine should be no more taboo than adding lime to cheap, watery beer. What is a wine punch, like sangria, if not bad wine sweetened with liqueur, soured with citrus, and aerated in pitchers and bowls? Of course, you're not going to make small-batch punches when you just want a simple glass of wine. That's where science comes in. To figure out how to "fix" bad wine, we got some vino and tinkered with it. To ensure the wine’s unpleasantness, we spent no more than $5 on any bottle (far less on most). These wines were bad. But with a little know-how and a touch of MacGyverism, we fixed them. Here's how. The most common way for drinkers to enhance good wine is to decant it. A freshly opened bottle of wine will have been locked inside a tight space for months, or preferably, years. 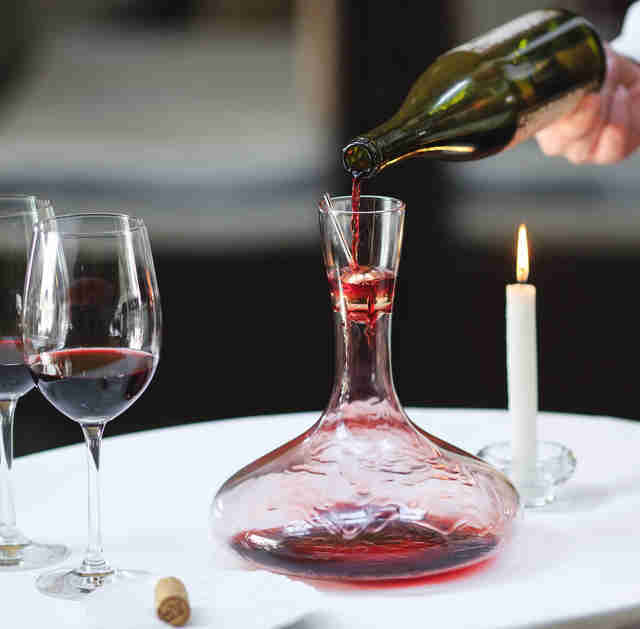 Decanting wine into a wide-mouth vessel allows more oxygen to get into the drink. However, if your cheap wine has an unpleasant stench, you might want to keep some of those aromas locked up. Since 90% of “tasting” is actually smelling, we tried drinking bad wine out of tumblers with lids, or “sippy cups.” By keeping the lid on, we were spared from the uncomfortable aromas. To then further enhance this experiment, we played with perfuming the lid. Try rubbing the area where your nose hits with an aroma that complements the style. If drinking a cheap merlot, for example, try rubbing the lid with blackberries. The experiment will have you tasting better wine without adding anything directly to the liquid. On the other hand, if a wine wasn’t properly exposed to oxygen during the winemaking process, it becomes strangled and the aromatic compounds can’t blend. This creates sulfur compounds that cause a wine to be “reduced.” Reduced wine has the unpleasant aromas of boiled vegetables, rotten eggs, and burnt rubber -- not the exactly the flowery description the label promised. Some hours in a decanter can allow these smells to “blow off” and let the more promised fruity smells prevail. We gave an at-home aeration system a go to speed up the process of adding oxygen, and it helped some. Wine can be aerated faster in a blender or by using a whisk. We experimented with both on a malodorous screw-top pinot grigio and found that whisking worked just as well as blending, and made for an easier cleanup. You can effortlessly aerate wine by keeping it open for a few days before you drink it. Keep the wine in larger containers, like magnum bottles or big jars that seal. The open headspace in the bottle will aerate the wine effectively without the use of bulky kitchen appliances. The solution to the unpleasantness of many cheap wines is balancing the acidity. A squeeze of lemon is the quickest and easiest way to brighten flabby wine. Allow your glass to sit for a minute to make sure the lemon is well mixed in, and then wipe the rim of the glass to ensure there’s no residue. The aromas of lemon will integrate into the existing bouquet, leaving you with a more balanced end product. Lime works in a pinch, but not as well, as it contains less citric acid. You can also add the most common acid found in processed food -- citric acid. You could try a vitamin C pill. Make sure to get a brand that doesn’t have flavor additives (no Flintstones). Still, even if you grind them up really well, these things are hard to dissolve and every vitamin we tried still finished with a chalky, rosehip tang. The best solution we found in the pantry was the citric acid dust scavenged from the bottom of a bag of sour candy, like Sour Patch Kids. This powder fully dissolved into the wine, and potently boosted the acidity. There was little, if any, noticeable candy flavor. It does take quite a bit of the flavor dust to make your wine zippy, so unless you have a pack-a-day gummy worm habit, you probably won't be able to collect enough of the stuff to correct more than a glass at a time. If you plan on drinking a lot of cheap, flabby wine, it might be worth investing in a pack of citric acid from a homebrew shop. Chaptalization is the addition of sugar to wine to boost the potential alcohol on difficult vintages. It’s widely practiced in cooler wine regions around the world. While most bad wines you’ll purchase in American supermarkets won’t lack sugar (if anything, they’ll be too sweet), occasionally we’ll encounter a cheap wine that is thin and acidic. Granulated sugar can be hard to incorporate. Stevia works better. Adding simple syrup can help balance the flavors, but it also waters down the wine. The best way to sweeten wine is by adding unfermented grape juice. Using the grape juice that you’ll find at the supermarket isn’t the same, though. Juice grapes, like Concord, are very different from wine grape varieties, and will dramatically alter the wine’s flavor. Since sweeter wine will have a higher gravity than drier wine, a way to determine how much you’ve changed the sugar level is by using a hydrometer. These floating instruments can be found at homebrew supply stores. But that's only if you're getting super nerdy. The best measurement is your own taste. If you don’t think a wine is sweet enough, just dump more juice in. The popular rule with temperatures is that white wine is served chilled and red wine is served cool. In truth, cheap wine doesn’t need to be sipped and contemplated. Bad wine of all colors and varieties should be served cold, very cold. Like cheap “lite” beer, flabby, unbalanced wine becomes miserable when it warms up. Serving wine a little colder is also the quick fix for wine that is “hot,” or has a noticeable alcohol burn on the palate. Chill bad wine down to the coldest point possible before it begins to freeze. Frozen rosé, or frozé, might be a popular happy hour wine cocktail, but do not try this at home. First of all, making a slush without the machine is a demanding process that requires regular stirring and a ton of added sugar. Second, freezing a liquid concentrates the flavors, which is the last thing you want to do to your bad wine. 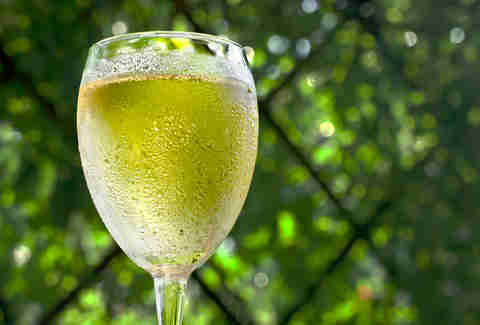 Unless the water is re-incorporated using a good slush mixer, a bad wine slush will taste even more like the bad wine. Hold up on those ice cubes. Watering down gross wine just means you have to drink more of it. If you want to keep your glass ice-cold, try whiskey stones. These rocks are kept in the freezer and are cherished by lovers of fine scotch for keeping their dram cold without watering it down. Note that chilling is best for bad wine that is aggressive and unbalanced on the palate, but it doesn’t do much for a wine that smells bad. This trick also won’t work for more tannic wines (few cheap wines have much in the way of tannic structure anyway). A chalky texture served ice cold is a terrible mix that reminds us of poorly churned ice cream. When wine is infected with a nefarious mold, it’s declared “corked.” It happens when any wine under cork enclosure becomes infected with Trichloroanisole, or TCA. In small amounts, this compound will flatten the aromas, and in larger concentrations, it creates a nauseating mildew smell. The whole ritual of testing a wine and inspecting the cork that’s done in fancy restaurants exists so that the customer can determine if the wine is sound. If there is a serious problem with the wine, it’s likely TCA. The best solution for corked wine is to return it. Any respectable retailer will take it back after taking a whiff. But if you’re not ready to get up off the couch, or maybe you’re just really thirsty, there is a solution. A well-known corked wine hack is to use saran wrap to leach out the TCA compounds that make it taste moldy. This weird trick works because the trichloroanisole compounds that cause cork taint are chemically similar to the polythene in plastic wrap. When you swish a ball of plastic wrap around in the wine, the compounds bind together and the moldy smell can be lifted right out. To be clear, this won’t actually fix corked wine. The aromas of the wine will be destroyed from the taint, and nothing can restore them. All the plastic wrap will do is possibly make the wine less moldy smelling. At best the wine will be drinkable, but not particularly pleasant. At least with the mildew smell gone, you can make a nice punch. Like chilling a beverage, carbonation helps to mute some of the off flavors. It works especially well with wine that is too sweet. Why does flat soda taste so nasty? Because soda is incredibly sweet. We’ve all seen those charts showing there is enough sugar in one can to fill up 60% of it. Making it bubbly helps a hummingbird-nectar-sweet drink become refreshing and palatable. Our first thought was to run our wine through an at-home carbonation system used to make soda and sparkling water. Be warned: manufacturers caution against doing this, and it will void warranties. But, it does work… even if the clumsy, soda-like bubbles are a far cry from the delicate mousse of Champagne. 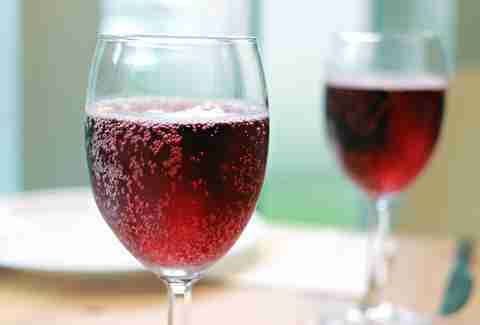 Oddly enough, the most popular way to make wine bubbly around the world is by adding sugary soda. Drinkers throughout Europe mix Coke and red wine, or even Sprite with white. This doesn’t correct wine as much as turn it into a mixed drink. If anything, we would add a hard mineral water. The traces of sodium compounds in mineral water can add a lingering complexity. Say you’re staying in a cabin and find a dusty old wine from the '90s that wasn’t meant to age past a year or two. You can tell pretty easily if the wine has been around for too long if it pours very light in color and smells nutty and washed-out. There is no way to restore vitality, but there is a way to ingest it without having to taste all those cabin years. Blend expired wine -- either that dusty, old bottle or one that kicked a week ago -- with a fruit-forward young wine. When carefully blended, old wine can also make the cheap, young one taste more complex. This is a bootleg version of the process used in wines with solera aging, like sherry. 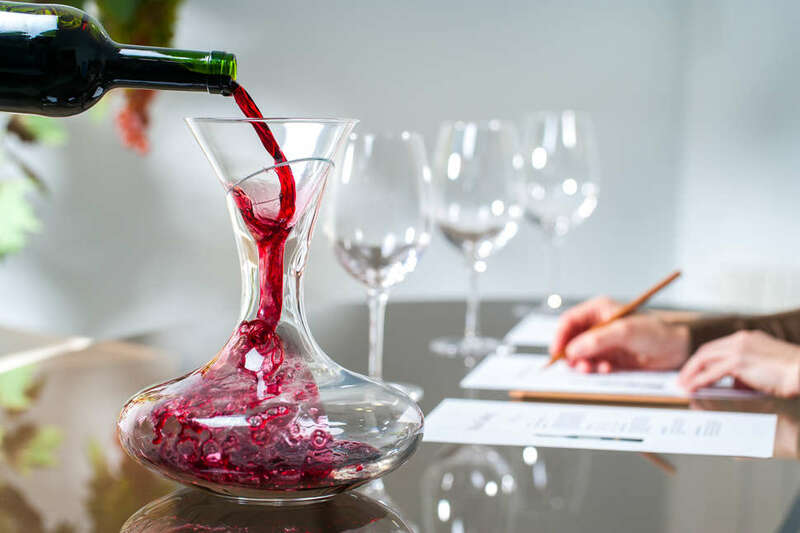 Pour the old wine through a mesh strainer (long-aged wine usually has a lot of sediment), then slowly blend it into the young wine until you’ve hidden as much of the flavor as you can without ruining the new bottle. It’s always good to have varying levels of cheap wine around anyway, in case of emergencies. Trevor Hagstrom and Maggie Rosenberg are regional food researchers who regularly wander country roads in search of the best dive. Catch their latest discoveries at tandmworks.com.